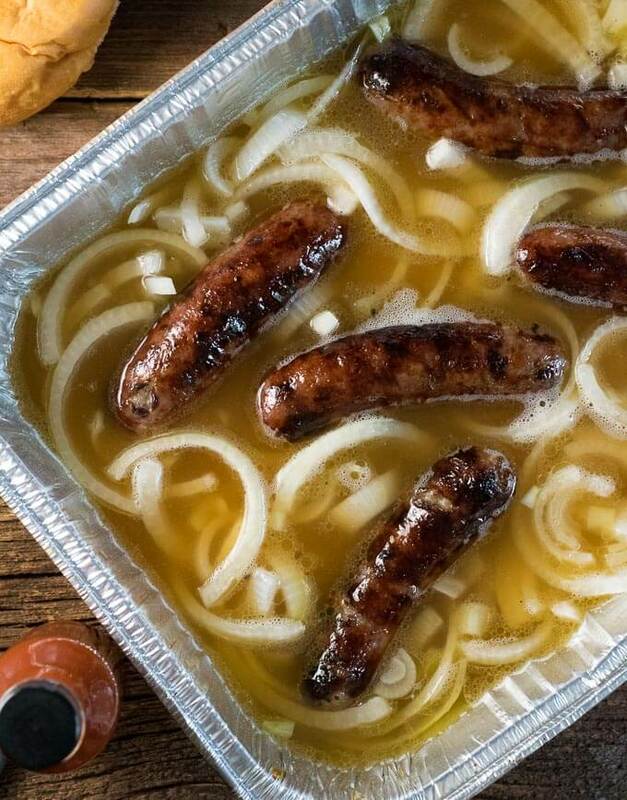 Whether you refer to it as a Beer Brat Bath or simply a Brat Hot Tub, this is the classic Wisconsin method for serving brats at your cookout. Enjoy Wisconsinbly. Smoke ’em if you got ’em folks! The charcoal that is. The grilling gods are shining down upon us again and it is cookout season! Here in Wisconsin, that means piles of juicy bratwursts will be slow roasted over searing coals before taking a flavorful swim a brat hot tub until one lucky Wisconsinite serves him up for dinner! Well, I want to change that. This uniquely Wisconsin tradition is ready to spread nationwide. It wasn’t too many years ago that you couldn’t find bratwursts in grocery stores outside Wisconsin, however, now they are readily available to any eager griller. So, America, if you are going to grill brats, I’m going to teach you how to do it right. Anyone who knows anything about Wisconsin knows we don’t do anything without beer. From our Friday Night Fish Frys, to our Beer Battered Cheese Curds, we love cooking with beer as much as drinking it. It should come as no surprise then that our preferred way to keep brats warm, and infused with flavor, is to simmer them in beer! For those of your unfamiliar with the Beer Brat Bath, this isn’t used to cook the brats. A proper brat should be slow roasted over the grill and only placed in the brat bath to keep warm and flavorful until it is time to eat. This is perfect for backyard parties because you can cook up a large batch of brats and people can eat them at their leisure. 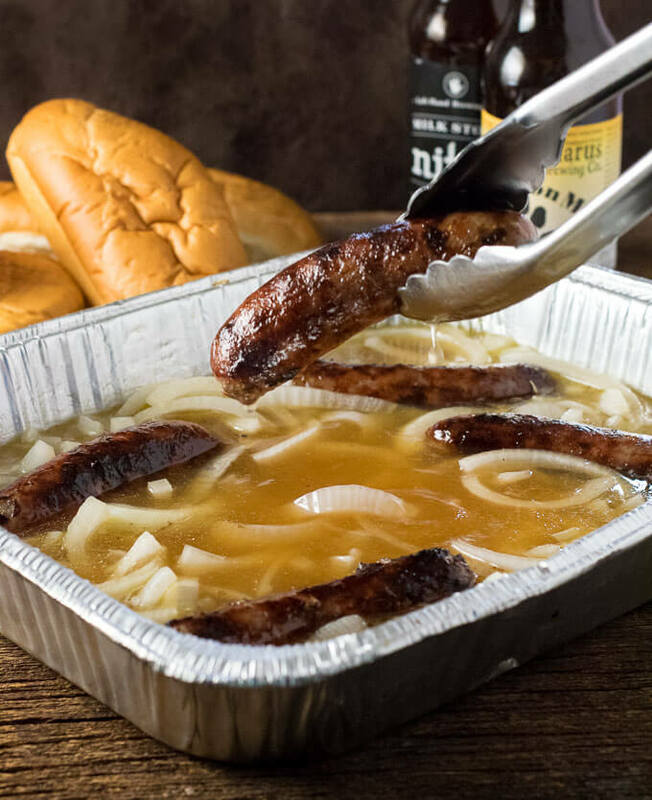 This beer brat bath is based on Johnsonville’s recommendations, though most Wisconsinites make a similar bath even if they’ve never seen a recipe for it. Since you aren’t drinking the beer, I recommend picking up a few bottles of cheap beer, like Miller, Bud, Pabsts, or whatever for the Beer Brat Bath. This will still give the brats the beer flavor while you reserve the good beers for drinking. 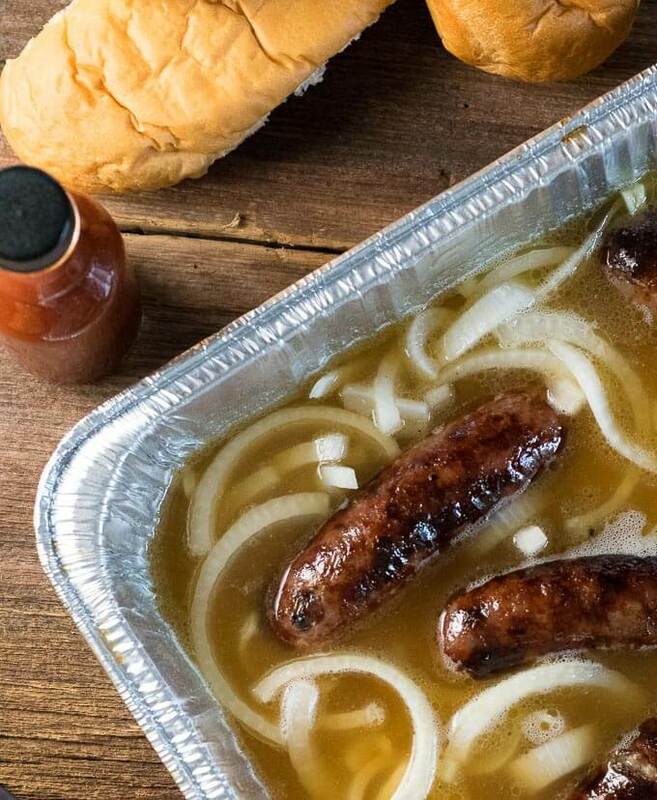 The best vessel to use for your Beer Brat Bath is a simple foil tray. It is disposable for easy clean-up, yet sturdy enough to withstand the heat of the grill. The above link is an affiliate link. 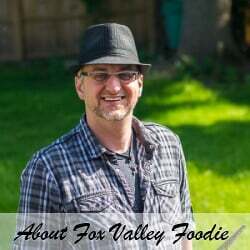 Any Amazon purchases made through this link helps support FoxValleyFoodie.com at no additional charge to you. Add beer, butter, and sliced onions to a deep foil pan. Place pan on grill over heat to bring to at least 160 degrees. Beer should be hot, but not boiling. Add cooked brats to the beer bath to keep warm for serving. Any cheap beer will work great. If you want deliciously tender onions, the beer brat bath needs to be heated for 30 minutes or more. When making brats I ALWAYS RECOMMEND using my Wisconsin Brat Sauce as your condiment. Check it out, you will love it! 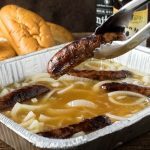 If you enjoyed reading my Brat Beer Bath – Hot Tub recipe then you should probably like me on Facebook and follow me on Pinterest too. That’s what I would do at least, because if you don’t get to know me but you still use my recipe it is kind of like taking candy from a stranger, and your mom taught you not to do that. Don’t disobey your mom, subscribe to Fox Valley Foodie today. It isn’t a Wisconsin cookout without a brat bath!